Tapping into the popularity of on-the-go nutrition, Nutra Organics has launched a line of Collagen Beauty Bars that incorporate the brand’s signature collagen powder. The new wholefood bars contain a range of ingredients designed to support healthy skin, hair and nails, including Verisol® Bioactive Collagen Peptides, vitamin C and zinc. 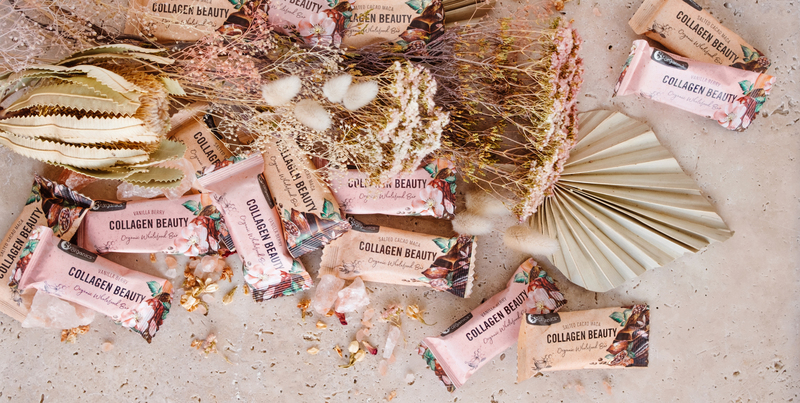 Each bar includes a single serve – or around 4000mg – of bovine-sourced collagen, which is clinically proven to reduce wrinkles and improve skin elasticity and hydration. The bars are also made with protein and hemp seeds and are naturally sweetened using rice malt syrup and date paste. The bars are available in Salted Cacao Maca and Vanilla Berry flavours and are packed in 100 per cent home compostable packaging made from sustainably harvested eucalyptus trees. Nutra Organics Collagen Beauty Bars are certified organic, gluten-free, dairy-free, and free from artificial ingredients.